by Geoff Leonard, Pete Walker and Gareth "The Completist" Bramley. 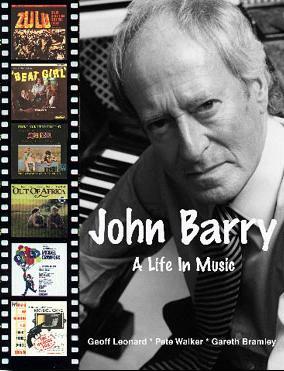 For more information, check the John Barry: A Life in Music website. As I write this, it's not out yet. You can pre-order it from Amazon.co.uk (Amazon.com's British sister, for those of us in the USA), priced at around £13 (down from a cover price of £19). I have no idea of Amazon.com USA will pick it up. I've purchased from Amazon.co.uk and had no problems; or you can try the Shop at Film Score Monthly, or eBay. I'll write a proper review when my copy arrives. Not currently available. 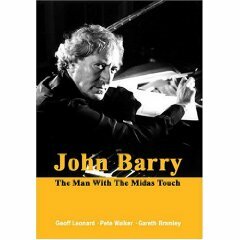 The new edition has been retitled John Barry: The Man with the Midas Touch. A long time in the making but ultimately worth the wait, John Barry: A Life in Music is the ultimate compendium for Barryphiles, soundtrack enthusiasts, and music historians. This large, glossy, and thoroughly engrossing book chronicles Barry's long and varied career, from his pop roots with the John Barry Seven up to and including his celebrated April 1998 sellout performance at London's Royal Albert Hall. Originally conceived as "Bond and Beyond," John Barry: A Life in Music is an authoritative 243 page guide that contains over 300 photographs, over half of them in color, and many not previously published. The highlight of the book, if you're looking for one, is an exhaustive 30-page discography which serves to illustrate the composer's amazing versatility as performer, producer, arranger, and writer. The discography section is augmented by a stunning full-color gallery of album covers that will make even the most conservative of Barry collectors drool in delight. Since Barry has never been much interested in--or forthcoming about--his back catalog, the authors were forced to concentrate their efforts on Barry's early career with the Seven, backing Adam Faith with those instantly-recognizable pizzicato strings, and serving as associate producer and creative A&R man at Ember Records, since they had greater access to those who worked with the composer during that time period. That said, Barry's innumerable film scores, stage musicals, and work for television and radio are all discussed here in meticulous, doe-eyed detail. John Barry: A Life in Music is clearly written with a passion for its subject matter and remains a fascinating reference for anyone the slightest bit interested in the veteran British film composer and his magnificent body of work. Hardcover published in November 1998, 352 pages. Softcover published in November 2001, 271 pages. I put off buying and reading this book because of the subtitle. Fiegel's interest here is 1960's British culture and John Barry's place in it. I had heard that the book was supposed to be much more about Barry's personal life than his music; so I expected precious little about the scores to the films from that era, and instead I expected the standard celebrity magazine flotsom about the cars he drove and the girls he had on his arm and how he decorated his fashionable yet cozy flat, and the parties he went to and the other 60's icons that he rubbed elbows with--until I wanted to throw the book into the fireplace. There was plenty of all that, but the book had meat as well as dressing; Fiegel was as interested in the music as well as the culture. In the forward she said that she began by enjoying the music and later wanted to know how it had come to be, which meant an examination of the pop-culture of the time. And Barry was not just part of pop culture--Barry helped create pop culture. The 1960's began with Barry as a rising pop band leader and ended with him scoring the mega-hit Born Free. In the UK, the decade became known as the era of the three B's: Bond, Barry and The Beatles. It was, in fact, the three B's that made London the entertainment mecca of the western world during that time. There was tremendous resurgence in British music and movies, led by the Bond movies and fueled by the success of Tom Jones, A Hard Day's Night and Alfie. John Barry had a foot planted squarely in both, and that made him a nexus in a world where working hard and playing hard fed each other. For all that, this is a fascinating book. But at the same time this biography is a disappointment. In the scope of the book, Barry would marry and divorce three times, and sire three children, with hardly a comment other than "it was the 60's." Like so many rose-colored reflections of those times, noone is willing to discuss the cost of hedonism. This biography was authorized by Barry and his cooperation is evident throughout, but it obviously goes nowhere that Barry won't allow, and this is where the book comes up short. For all the parties, the girls, the glamor and the music, this is not a tell-all biographry; Barry is a private man and enigmatic--most of us are only going to know him through his music and infer what we will. As with any printed interview, it is impossible to tell whether the hard questions were never asked or simply not answered. The bottom line here is that by the end of the book, the reader won't really understand the mind of John Barry much better than when he began. His drives, his emotions, his personal character are not in print. Barry is a reflective man, but it comes from a mirror that only he will see. The title makes it clear but it's still easy to forget--this book is about the music from the James Bond movie series. John Barry's contibution cast a long and deep shadow that continues to this day, even though the last Bond score he wrote was thirty years ago. The book goes film by film, beginning with Dr. No and (as of the edition I own) ends with Skyfall. The chapter discusses how the composer was chosen, how the title song and the score were each developed and recorded, and the critical response at the time. There's also a sidebar that discusses each soundtrack album track-by-track. I've read three of the Barry biographies and other books on the Bond films, and I still learned a lot of interesting things I knew little or nothing about. Burlingame does a very good job of tackling the sticky Monty Norman vs. Barry authorship controversy of the "James Bond Theme," though there's nothing really new from the Barry side of it one way or the other to really put it to rest. The development of the songs in each film is well done. Burlingame liberally quotes the lyricists, who shed a lot of light on how and why the songs turned out as they did. There are also comments from producers, musicians, the vocalists, and others to explain what went on. They're particularly good at explaining the "Mr. Kiss Kiss Bang Bang" debacle. Some things are still hazy, however. While the Moonraker chapter includes original lyricist Paul Williams's remembrance of working on the title song, we still never learn why Frank Sinatra left, and no real sense of what the Barry/Williams song that Johnny Mathis sung was like, other than that it simply "didn't work." A few things I wondered about are never discussed at all. There are mentions of artists being solicited for songs that never made it into the films (especially for the later movies where the score composer did not write the song). Johnny Cash had a "Thunderball" song right about the time of the film, but there's no mention if it was solicited or not. Likewise the rock group Blondie, at the zenith of their popularity in 1981, came out with "For Your Eyes Only" right about the time of the film, and there's no mention of that either. Those aren't titles that people typically use if they aren't forced to (as Don Black mentioned, in having to write a "Thunderball" of his own). As Barry scored eleven of the Bonds, (David Arnold is second most prolific with four), he's amply represented in the book. And even when he's not working on the film, the other composers and artists have to work with the Bond sound that he developed. So it's interesting to see how people like George Martin, Marvin Hamlisch, Bill Conti, et al., had to try to ackowledge what went before and still offer something fresh and new—and not always with successful results. I found the earlier sections of the book better than the latter not simply because I dislike the recent films, but because the early chapters tend to offer quotes from people who are far removed from the time and can talk candidly and with the benefit of hindsight. The concluding chapters' quotes read far too much like press releases and award-ceremony interview mutual admiration stroking. Regardless, it's an excellent book and a fun read. It treats the music in depth on several levels but never bogs down or bores. Highly recommended for Barry and Bond fans alike.